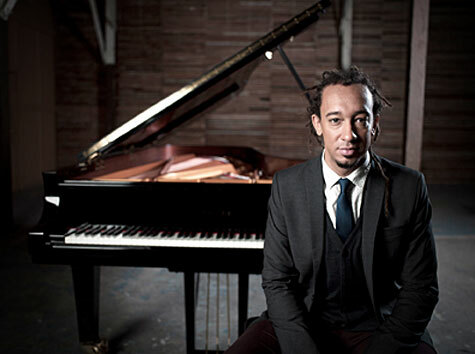 Virtuoso jazz pianist Gerald Clayton brings his hard-swinging, melodic style along with an impressive pedigree to the Lawrence Memorial Chapel Friday, Feb. 24 at 8 p.m. for the third concert of Lawrence University’s 2016-17 Jazz Series. Tickets for the Gerald Clayton Trio and special guest Dayna Stephens, at $25-30 for adults, $20-25 for seniors, $18-20 for students are available online through the Lawrence Box Office or by calling 920-832-6749. One of the leaders of the new generation of young jazz musicians, Gerald Clayton learned his craft playing with his legendary father, composer, arranger, conductor bassist extraordinaire John Clayton, and his uncle Jeff Clayton, noted alto saxophonist and multi-reed instrumentalist, in the Clayton Brothers combo. A four-time Grammy Award nominee, Gerald formed his own trio in 2008 with drummer Justin Brown and bassist Joe Sanders. The trio will be joined for the Lawrence concert by tenor saxophonist Dayna Stephens, a former student of trumpeter Terence Blanchard, saxophonist Wayne Shorter and pianist Herbie Hancock at the Thelonious Monk Institute of Jazz. Clayton’s discography includes his 2010 debut, “Two Shades,” for which he earned a Grammy Award nomination for best improvised jazz solo for his arrangement of Cole Porter’s “All of You.” His most recent releases 2012’s “Bond: The Paris Sessions” and 2013’s “Life Forum” both earned Clayton Grammy Award nominations for best jazz instrumental album. The Delfeayo Marsalis Quintet closes Lawrence’s Jazz Series on May 13.